Hundreds of people marched in Portland to protest racism, August 2017. 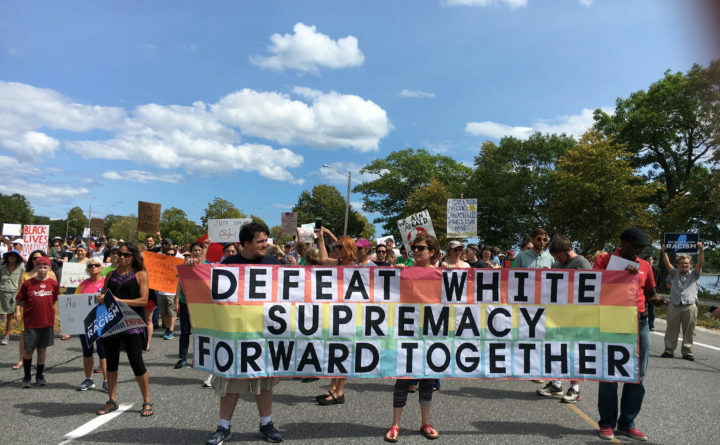 PORTLAND, Maine — A coalition of nonprofit groups has joined to create unifymaine, an organization designed to call attention to reports of bias incidents and hate crimes throughout Maine. The mission of unifymaine is “to present a united front of Mainers from all walks of life” against hate crimes and bias incidents, to make Mainers aware of such incidents and to “loudly tell traditionally targeted groups that the majority of Mainers do not support hatred in any form,” a release from the new said Wednesday. The goals of the organization include offering dignity to victims of hate crimes and bias incidents, and calling attention to their circumstances so as to decrease hostility to traditionally targeted groups in our midst; assisting victims as they seek resources from and connections with community groups and law enforcement; supporting community responses to hate and bias incidents; and informing Mainers so they are encouraged to stand up against incidents of hate and bias when they seem them occurring. “unifymaine is an effort by Maine’s various communities to shine a light on hate crimes and bias incidents and to speak out with one voice to say that hate has no place here,” said Steve Wessler, a longtime Maine human rights educator, trainor and advocate. The organization is founded by the Maine Human Rights Commission, EqualityMaine, Maine Women’s Lobby, Disability Rights Maine, Greater Bangor Branch NAACP, Robert Talbot, Maine Council of Churches, Wessler, and the Immigrant Resource Center of Maine.